A few days ago one of the senior command colonels decided this place needed a change. So he asked one of our interpreters to bring in a turkey. A live turkey. Feet tied. In a small crate. Head up just looking around. Gobble. In a hospital. It did create a stir. Decided to put it into a big box inside the hospital, after all, turkeys can’t fly. At least not well. It was such fun watching people’s faces as they walked by, glanced in the box and saw … a TURKEY! The turkey quickly demonstrated that he could jump to the edge of the box and try to escape. 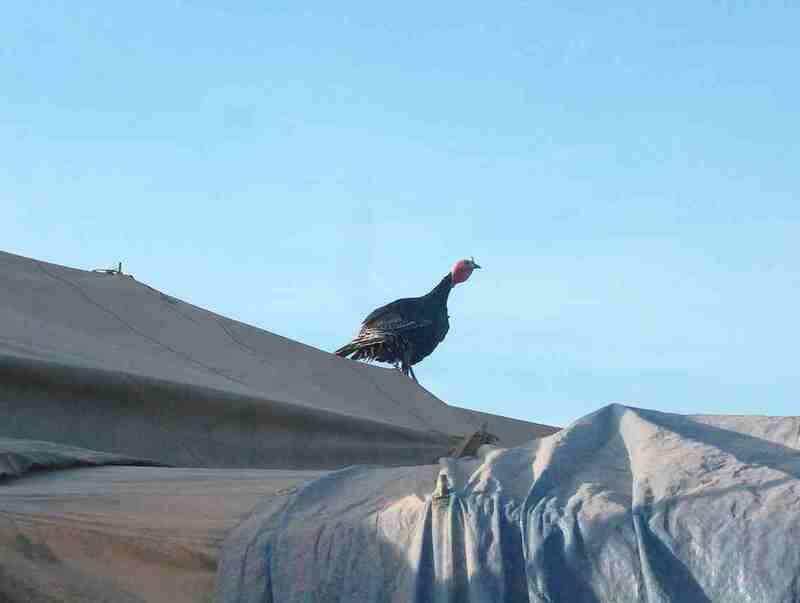 COLONEL *****, COLONEL******, YOUR TURKEY”S ON THE ROOF!!!!! Picture this: a major running in a high state of excitement searching for Col ****** to tell him his pet has escaped. Can I threaten the life of a superior officer? Would it get me out of here? The colonel kept saying – he’ll come down, he can’t fly anyway. 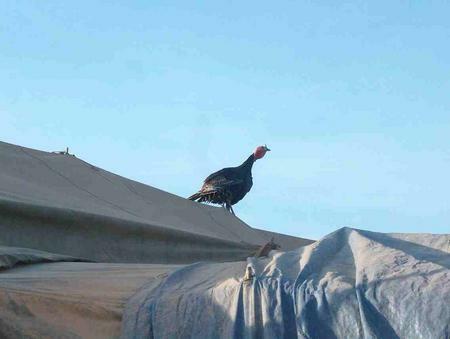 Just at that time the turkey demonstrated his inability to fly by flapping his wings and not-flying the length on the tent and on into the ambulance parking area. 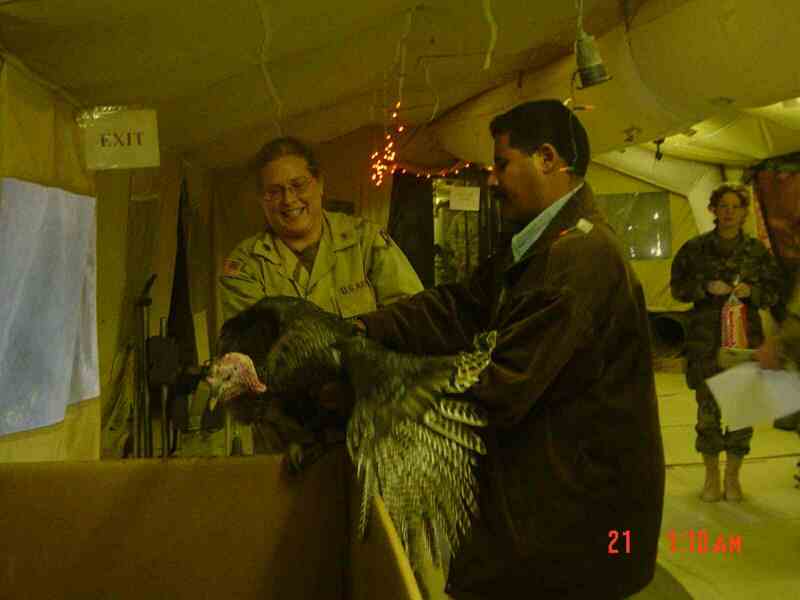 So here was a senior colonel, and three majors (we picked up another during the fuss) chasing this turkey all over our compound! The turkey made his bid for freedom by going through the concertina wire around our area, unfortunately for the turkey the three insane majors, lead by the questionable colonel, followed the turkey through the wire. The chase ended when the great turkey hunter took a rolling dive at the turkey - which missed. His scrambling recovery though allowed him to grab the turkey’s neck and foil it’s bid for freedom. 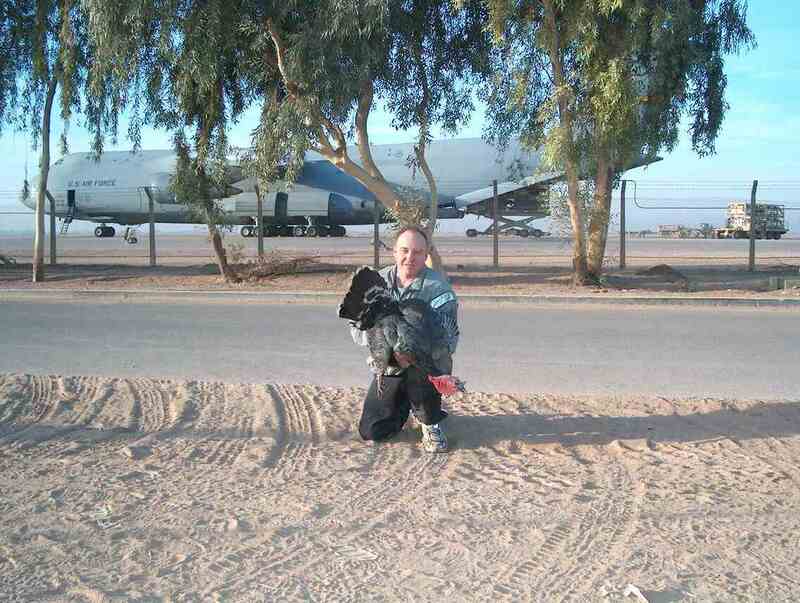 Which was a good thing as the turkey only had one fence between it and the flight line. We couldn’t follow it there, and I’m sure the flight controller would have appreciated this big bird on his flight line. Of course the turkey’s freedom would have lasted until it got sucked up into the engine of that C5 behind it. Best hours worth of fun I’ve had since I’ve been here. No, we didn’t eat it. Wasn't that a MASH episode? Seriously though, Happy Thanksgiving - you are in my thoughts and prayers today and always. I'm thankful beyond words for your contribution to a peaceful and prosperous future for so many lands and peoples! Hope you're enjoying that peaceful prosperity soon. Take care. I want to wish my husband SFC Alfred L. Young in Bear North Iraq a Happy Thanksgiving and to all the other soldiers in Iraq as well. Happy Thanksdgiving, and stay safe out there. major, the more i read your postings, the more I am convinced that army field hospitals must have a tradition exactly in the mold of M.A.S.H. this proves it beyond all doubt. BTW-i found an item at INTEL DUMP, posted from DEFENSELINK, about a lifesaving invention they rigged over at the 28th CSH which you guys might want to repeat at the 21st: when you get patients with blood loss resulting in dropped body temperature, forget the heat lamps and blankets and use what Irby invented: cover them with a cardboard box big as a coffin, cover it in sheet plastic for air retention [gift wrap style] and stick a handheld blowdrier in a hole cut in the top center, set to blow on high heat. the 28th has saved upwards of 20 lives using this device. they call it the 'Cheif Cuddler". it'll bring body temperature up to 98.6 faster than anything else you have on hand, stop internal bleeding by promoting clotting at normal body temp, is dry for coagulation and granulation, and I bet you have the parts on hand. personally, I would use as many blowdriers as you can press into service, not just one. you just put it over the patient, wholesale, on their bed, like a chafing dish cover, and let them warm up, in spite of their blood loss. It works great. the temp in the box should get to about 105°F-like a nice high fever. also kills infection at that temp. isn't this proof that you CAN fly with eagles, and still work beside turkeys? sorry for an error--Irby was profiled in 'defendamerica' for his invention of the "chief cuddler' to warm up blood-loss casualties. I read today that Thursday is the last day that gifts can be shipped to the troops from the states, and that they can only be shipped to individuals. Can you put us in touch with some folks to whom we can express our appreciation by shipping some practical gifts? If you could write back by Wed MST I'd really appreciate it. Just discovered a website called Operation Gratitude. Sounds great, but then found your website as well. My family and I will write letters, and send care packages. I am sure you receive these thoughts all the time, but could you pass on to the troops that the Stanaro family is profoundly proud of them and grateful beyond words for their sacrifice? We can't imagine how tough it is there and we hold our heads up high (here in Europe!) when we think of all of you- the professionalism, the goodness of all of your brave guys out there. I'm 44, child of the Sixties. I've three young kids and I hope I can raise them all to give their life to a bigger cause than themselves as all of you are doing. I hope that you all don't take for an instant, seriously, all of the garbage spouting out of Democrats like Hillary, Dean et al. They don't represent your country or our feelings. Nor should listen to or give a second thought to the noise out fo the French, Belgians, Germans, or any of these ungrateful Europeans. Focus on the Poles, the Italians, the Australians, Romanians, British- all of our true friends. God Bless and keep all of you. We are constantly thinking of you and praying for you. You are doing very important jobs there- more than so many people may realise. i just wanted to tell the soliders and there family thank you and god bless you all!